MOSCOW, March 16. /TASS/. A portion of funds required to fulfill projects by President Vladimir Putin announced after the State of the Nation Address to the Federal Assembly will be obtained through a reduction in defense and capital construction expenditures, Russian President Aide Andrei Belousov told reporters on Friday. "We have already mentioned that we would cut defense spending in line with GDP. This will be simply because we have passed the peak of saturating our defense forces with new types of armaments and military equipment. There is definitely room to boost the efficiency of budget expenditures in general and accordingly cut spending on capital construction. This is a huge sphere, worth about 600 bln rubles ($10.4 bln) annually, and savings can also be achieved there, amounting to tens of billions of rubles at minimum," Belousov said. Total costs to fulfill the Russian president’s assignments will be about 1.5% of the GDP in six years, with the greater portion to be covered through accelerated economic growth, he added. 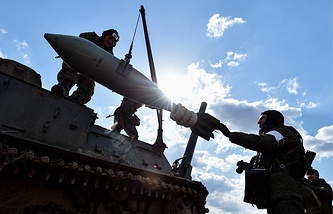 No hikes in defense spending are planned, Russian Finance Minister Anton Siluanov said earlier.